South Africa’s downgrade to junk status (April 2017) rocked the country - leaving business owners walking on eggshells, waiting for the inevitable fall out to follow. Businesses approached the second half of the year with a healthy dose of caution, attempting to postpone any big financial decisions until 2018, when the proverbial dust settles. Now that 2018 has arrived, here’s a look at the changes we can expect to see taking effect during the next 12 months. One of the key challenges that supply chain executives will face in 2018 is perfecting “right-sizing”. Achieving the perfect balance between excellent customer service (having the right product available in the right place at the right time) and reducing inventory to save space and costs will be a priority, as budgets will be tight this year. Businesses that successfully understand their products’ supply and demand needs, will gain a competitive advantage over those that haven’t. Supply chain management software provider, Logility, says that recent studies show that 85% of all companies implementing a formal demand management program generated significant performance improvements. Average gains include 13% improvement in overall forecast accuracy, 24% faster inventory turns and 5% improvement in gross margin. The right warehouse management system (WMS) will be able to assist with forecasting, providing accurate data to guide decision making. Optimising the design of your warehouse floor to make sure products flow efficiently will greatly increase productivity. Supply chain executives should focus on creating multi-purpose facilities, which maximise the use of available floor space. In 2018, businesses will need to design their warehouses and distribution centres (DCs) Omni Channel in mind. This means trying to keep everything under one roof. Businesses should create all-purpose facilities that communicate with each other (with the capabilities to handle small to large scale orders) to speed up service delivery and improve customer service. Omni Channel is a movement toward truly unified commerce. The goal is to create a seamless customer experience, whether buyers order via a mobile app, an online store or from a traditional brick-and-mortar retail outlet. 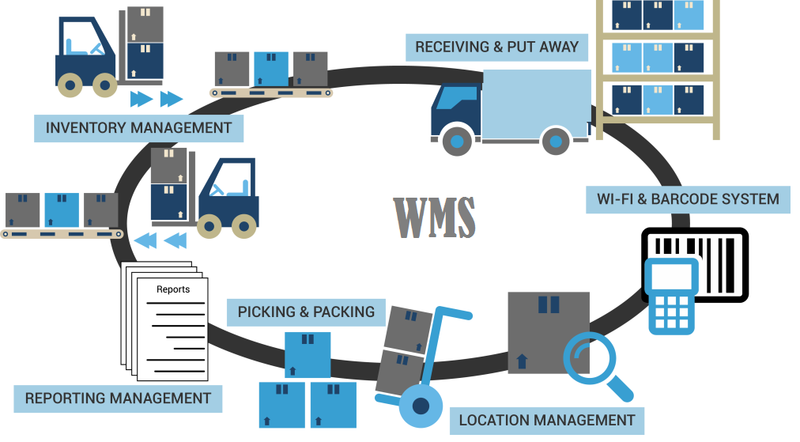 Your warehouse management system (WMS) will be able to provide valuable historical data to help identify, for example, how often a particular item is picked, helping you streamline your operations to maximise your ROI. The global chatter around the term IoT is rapidly moving from buzzword to an actual Digital Economy. The Internet of Things refers to the networking of machinery (like cars, fridges and other appliances) via artificial intelligence (AI) to the internet. In short, we’re headed for a smart world where everything around us talks to each other. IoT allows supply chains to collect large amounts of quality data. This helps with refining processes, predicting problems before they occur and allows supply chain executives to put in place preventative measures to avoid any unnecessary interruptions. While the term IoT isn’t new to the logistics industry, South Africa is about five to six years behind Europe and the USA when it comes to the adoption of technology and automation. This is mainly because we don’t currently have the infrastructure in place to support fully smart machinery (like autonomous vehicles). If you’re looking to align your business with global best practices, you’ll need to start planning and preparing your warehouses, DCs, inventory plans, transportation and your staff for full automation in the future. According to Ethical Corporation, 30 percent of companies say, traceability and environmental concerns are their biggest issues to keep an eye on. Warehouse management systems have provided unique insight into the extended supply chain, by giving supply chain executives access to quality data. However, data without context is useless - and can even be harmful if incorrect conclusions are drawn through lack of analytic skills. Learning to interpret and action insights derived from big data will be a huge focus area in 2018. Training programs that help managers and executives understand which metrics to measure, and how to turn raw data into useful information will be the key to future-proofing your business. Staff will need to understand how to take the intelligence they’ve gathered and translate it into continuous optimisation. Supply chain management is a complex industry. To be successful, you’ll need a robust strategy and supporting processes to achieve your business goals. One of the best ways to keep your organisation at the forefront of global supply train trends is to benchmark against global best practices. Read our article, Why benchmarking your business matters, to find out how you can assess whether your operations and processes are on par with global best practice. Businesses should be looking to collaborate with other big players, by forming mutually beneficial strategic partnerships as opposed to traditional supplier-customer services. This will help you reduce costs and navigate the increasingly competitive South African market. Subscribe to our blog and stay on top of the latest industry trends. Our supply chain experts regularly update the Supply Chain Junction blog with insights from managing your warehouse to training your staff, demand forecasting, customer service and more.